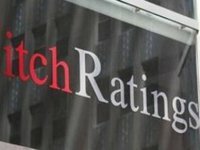 The Fitch international rating agency has noted improvement in the solvency of Ukrainian banks, while noting that some financial institutions need additional capitalization, according to a press release from the rating agency. "At the end of Q1, 2018, most of the largest 25 banks (together representing over 90% of sector assets) were compliant with the standard regulatory capital adequacy requirement of 10%," the document states. Fitch experts added that problem assets remain relatively high. "Impaired loans, which are mostly legacy exposures and include both those more than 90 days overdue and those with a low probability of repayment, represented 56% of loans at the end of Q1, 2018," according to the report. "In 2018 the National Bank will conduct a new asset quality review and capital stress test on the largest 25 banks to identify any capital shortfalls that need to be covered by bank owners," it says. "We expect the asset quality review to confirm some recapitalization needs as individual banks have moderate reserve coverage of restructured exposures (mostly captured in the impaired category). State- and foreign-owned banks should be able to receive additional capital support, if needed. Privately owned banks may have more limited access to new capital and in some cases may be understating loan impairment, in our view," the experts said.